Pre-surgical considerations, diagnostic testing and medications. Day of surgery instructions and medications. Specific information related to the use of anesthesia. In addition, you will be asked to sign consent forms to assure your plastic surgeon that you fully understand the procedure you will undergo and potential risks and complications. Risks associated with eyelid surgery include poor healing or infection at the incision site, temporarily blurred or impaired vision and dry eye. Difficulty closing your eye is also possible, and usually temporary. 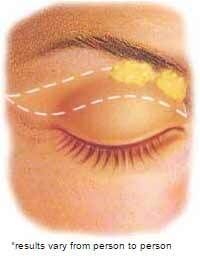 Ectropion, a pulling down of the lower lid may occur in a small number of cases and is often temporary. These risks and others, as well as the risks associated with anesthesia will be discussed prior to your consent. It is important that you address all your questions directly to Dr. Kim. It is natural to feel some anxiety, whether excitement for the anticipated outcomes or preoperative stress. Discuss these feelings with Dr. Kim. Eyelid surgery may be performed in your plastic surgeon’s accredited office-based surgical facility, an ambulatory surgical facility or a hospital. The decision for anesthesia will be based on the requirements of your specific procedure and considerations of patient and surgeon preference. Dr. Kim and his staff will fully attend to your comfort and safety.